In 30 minutes you can have a flavorful nutritious meal on your table. This meal is a one pot wonder. The mustard sauce is light, flavorful and delectable. Roasting the chicken along with the chicken adds extra flavor to the cauliflower. In a ziplock bag add chicken thighs and mustards. Massage the mustards into the chicken thighs. I marinated mine for about an hour, however, you can put it in the dutch oven immediately. Add avocado to a large dutch oven and brown chicken thighs, skin down. When thighs are browned, turn over thighs skin side up. Add cauliflower in between the chicken thighs. Drizzle remaining avocado oil over cauliflower. Sprinkle all-purpose seasoning over cauliflower. Roast in oven for 20-25 minutes or until it is cooked through. Remove from oven. Scoop out cauliflower from dutch oven and spread out on a platter. Layer thighs on top of cauliflower and set aside. Be careful the dutch oven will be very hot. Place dutch oven on to the stove top and heat on medium. Add flour to dutch oven and scrape the flavor bits and flour; stir until a paste is formed. Add chicken broth and stir until well combined and sauce has thickened. 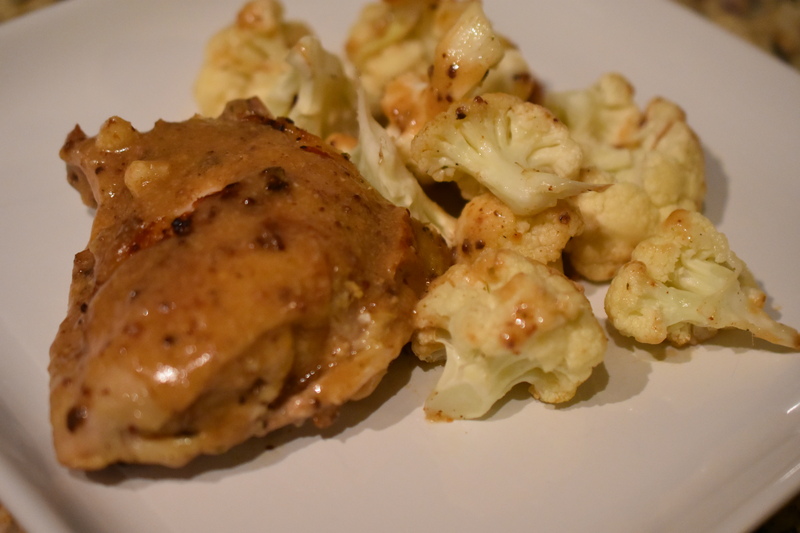 Pour over chicken thighs and cauliflower. Serve. Eat. Enjoy. That looks really delicious! I will have to try it! Thank you Sylvie. I really hope you do. Let me know if you give it a try.